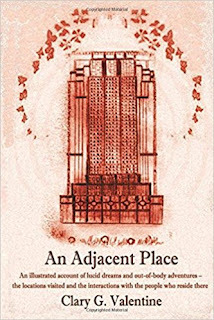 Today I'm reviewing the book An Adjacent Place by Clary G. Valentine. I love love love this book! I'm getting goosebumps just writing about it. At the end of March, I reviewed a book called Astral Projection as a Bridge to the Spiritual World, and at the time I complained that the title was misleading: I had hoped for a book that used out-of-body experiences to visit the spirit world and bringing back information. Well, An Adjacent Place, gave me all that, and much more. Why is the book titled "An Adjacent Place"? Many OBE authors talk about the "Real Time Zone" or the "Shadow World" or something similar; a place that's almost like Earth, but not quite. Many of the experiences in the book seem to have taken place there. Just to make it clear: There are really no OBE tips or techniques in this book. It's pretty much autobiographical, all narratives, and supposedly all true. To protect their identities, the author changed the names of everyone in the book, including his own: He's writing under a pen name. At the start of the book, it's February, 2014. The author, Mr. Valentine, is a Englishman living in the Philippines and he learns that his good friend, a Filipino woman whom he calls April has started to have "clear dreams." He's not sure at the time whether these are lucid dreams, out-of-body experiences, or something else, but they seem to be incredibly vivid to her. These experiences are preceded by a rushing energy sensation that starts are her feet and sweeps through her whole body. Valentine seems to be fairly skeptical (or sceptical, if you're British) and level-headed about April's experiences, but he takes them seriously and documents them. And he's smart enough to ask for lots of details from April. April is a simple woman with a very basic education, a charming innocence, an almost photographic (or near-eidetic) memory, and above average artistic talent. So she's not only able to describe her experiences in vivid detail; she can actually draw them with reasonable accuracy. Early in the book, April is taken out of her body and meets an old woman who introduces herself as Clarissa. Clarissa explains that she is April's maternal grandmother. April never knew her grandmother because her mother had a major rift or falling-out and they had become estranged. Naturally, April calls her mother and asks her grandma's name, what she looked like, etc. She's surprised to learn her grandmother's name was Clarissa, and looked exactly as her mother described. Hm. That's an interesting coincidence, right? Soon, April is having "clear dreams" almost every night, and usually her grandma, Clarissa, is there to greet her and take her on out-of-body journeys. She introduces April to several more of her relatives she had never known. Her maternal grandfather, Ben. Her great aunt, Merissa. Merissa's elder daughter, Mely, and many others. She learns from her mother that these were also all real people who had passed on. Valentine figures that April must be dredging all this information up from her subconscious: things she had heard from her mother as a child. Clarissa takes April on OBEs around the world to places she's never visited, like Clarissa's home town of Iloilo. They visit various homes, churches and landmarks and meet various people along the way. At Valentine's suggestion, April comes back with specific names, dates, and addresses. He's then able to verify that yes, these places do exist (or once existed), and these people were real people. 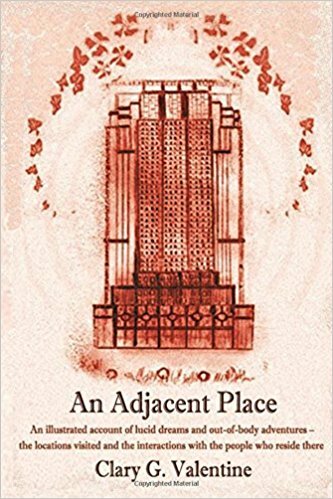 What's more, April spends an hour or two drawing a church or landmark in great detail (the book's cover is one) and Valentine verifies the accuracy. Valentine takes more precautions, like checking web browser history and such, but apparently there's been no cheating. Often, April doesn't know where she's going, and can't really pronounce the names of these places, so she gets Clarissa to spell them out. For example, they visit the town of Dyrehavsbakken, a place neither of them had heard of. Valentine is shocked to find out it's the name of a real place, and all the details of April's visit seem to match. In one case, April thinks she's in the Philippines near an active volcano. She asks Clarissa to spell out the name of the place, and Clarissa spells out "G-U-A-T-E-M-A-L-A". It turns out they are near the Santa Maria volcano in Guatemala! Valentine has no idea where April is getting this information, but he starts to take more precautions to make sure she's not using her cell phone to look things up in the middle of the night. Valentine decides to ask April to do some experiments and she agrees, just for the fun of it. He asks April to determine something neither of them knew: the name of Pluto's moon. He fully expects her to fail, but in the morning, he finds she had sprawled two things on her note pad in the middle of the night: "Charon 1978". He looked it up on the Internet and found out one of Pluto's moons is named Charon. It turns out 1978 was the year of its discovery! This is getting so good it's absurd. Okay, maybe she had heard it once and buried it in her subconscious. He tasks her to find out the moons of Jupiter, and she comes up with the four largest moons: Europa, Io, Callisto, and Ganymede! Soon she's visiting strange buildings in strange countries and coming back with very specific information, and in many cases, she makes detailed drawings. And Valentine finds out that, as far as he can tell, it's all factual. For example, in an OBE, she's taken to a building in some city neither of them know. She's introduced to a man who gives her many details about his life: his full name, the year he was born, the year he died, his wife's name, his children's names, etc., and it all ends up checking out. Then she sits down and draws an amazingly accurate rendition of the building from memory. In many cases, Valentine thinks the information she gets is wrong, but further research later proves it's not. For example, she visits a royal palace in England, and does a beautiful drawing. Since it doesn't match any of the royal palaces Valentine knew, he thinks it's incorrect. But further research proves it to be an actual royal palace after all. She visits royalty, talks to servants, and gets loads of stunning details, all verified. This book is not some strange man making fantastic claims about his astral escapades, and their significance, from a position of superiority. He's not pushing an agenda nor selling anything. This is a level-headed ordinary guy who's absolutely incredulous and dumbfounded at what's happening to his dear friend. The book kept me fascinated and I found it very hard to put down. Almost every page I thought to myself, "Wow, this is fantastic!" and it just kept getting better til the end. Several times throughout the book, I got chills up my spine. The book is very well written. Valentine's writing style is very British, which means it's prim, and proper, and yet very approachable. Every sentence is well thought out and expertly crafted. The book is 240 pages, with a smallish font and slim margins, which means there's a satisfying amount of content. I found only two small mistakes in the book, so the editing was professional quality. I thoroughly enjoyed this book and give it 4 1/2 stars. Valentine tells me April has been having experiences since the book was published, and he now has enough material to write a sequel. I can't wait. 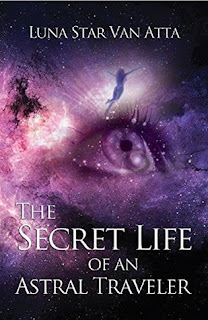 Today I'm reviewing the book The Secret Life of an Astral Traveler by Luna Star Van Atta. A few weeks ago, Kathy and I were driving through Sedona, Arizona, a haven for New Age people. As I drove past a shop called Sacred Light, I got the urge to go in. I turned around, drove back to their parking lot and went in. Inside the shop, I noticed a sign that talked about an Astral Projection class! I thought, "Isn't it wonderful how the Universe always guides us to where we're supposed to be?" I asked the woman behind the counter about it. She said, "The class is still going on. It should be almost over by now. If you want, you can just wait a while until the class is over." Wait, I thought, the class is almost over? Maybe the Universe steered me in here too late after all. I said, "Crap! I wish I had known about this class; I would have signed up. Where do you find out about these things? I checked Kudos and meetup.com and never saw it." I never did get a good answer. After Kathy and I waited in the store, looking at crystals and such, the cashier looked at her watch and said, "The class is probably over now, so you can go back and talk to Luna. But be careful not to interrupt the class if it's still going on." We proceeded down the long hallway. When we got to the classroom in the back, the class had ended and the students were hugging and saying goodbyes. I introduced myself to the class instructor, Luna Star Van Atta, and gave her my business card. I explained that I had a blog about astral projection and did out-of-body experience book reviews, had done more than 70 of them, and if she gave me a copy of her book, I'd review hers too. She was happy to do it. As we drove away, I wondered: Who is Luna Star Van Atta and why haven't I heard about her before? Why has her book escaped my attention? Still, the book is pretty new--copyright 2016--so I cut myself some slack. The book opens with a bang: Chapter 1 is the very emotional, touching, and well written story about the death of the author's husband and soulmate, Michael Van Atta, from cancer. Then the book rewinds back to an earlier time. Chapter 2 tells the story of Van Atta's near-death experience (NDE) and how it opened her up as a psychic and healer. It also inspired her to try to seek more out-of-body experiences, to try to reconnect to Source/God/Whatever label you want to give it. First she turned to J.H. Brennan's Astral Projection Workbook, then to other sources. I guess I shouldn't be so black and white. After all, it's all a matter of how much conscious awareness you place "there" versus "here" right? It's variable. After a few more chapters it dawned on me: What Van Atta is describing are basically "Focus Level" experiences like the Monroe Institute teaches, but she's calling it astral projection. At the RV class, Michael and Luna hit it off right away. There's just one small problem: Both she and Michael were married to other people. Ooops! Luna finds out that she's actually pretty good at Remote Viewing, and so is Michael. So they basically start seeing each other--a love affair--in an agreed-upon location they designed in the astral plane! Were they just fantasizing about each other? Maybe, but in many cases, they corroborated each other's stories of what they saw and what happened. Eventually, after a lot of time passes, they divorce their respective spouses and marry each other. Then the real adventure begins. Though the book is anchored in New Age philosophy, there's a certain reverence, acknowledgment, and head-nods to God throughout. There are no tips or techniques for achieving out-of-body experiences, or even remote viewing, so it's mostly just narratives. But the stories are good. The book is average size, 199 pages, and decent font, so you won't feel short changed on content. The writing is very good, and I found very few typos and grammar issues.